PAHOA, Hawaii–More homes on Hawaii’s Big Island were destroyed on Saturday as eruptions linked to the Kilauea volcano increased, spewing lava into residential areas and forcing nearly 2,000 people to evacuate, officials said. Scientists forecast more eruptions and more earthquakes, perhaps for months to come, after the southeast corner of the island was rocked by a 6.9 tremor on Friday, the strongest on the island since 1975. The U.S. Geological Survey (USGS) said on Saturday that several new lava fissures had opened in the Leilani Estates subdivision of Puna District, about a dozen miles from the volcano. Not all the fissures were still active, it added. Babb said the activity since Thursday is beginning to show similarities to another event in the area in 1955 that lasted for 88 days, when far fewer people lived near the volcano. Although no significant lava flows have yet formed, additional outbreaks of lava, which can reach temperatures of about 2,100 degrees Fahrenheit, were expected, the Hawaii County Civil Defense Agency said. The Hawaii Fire Department reported “extremely dangerous air quality conditions due to high levels of sulfur dioxide gas in the evacuation area,” civil defense officials said on Saturday. The gas can cause skin irritations and breathing difficulties. Kilauea, one of the world’s most active volcanoes and one of five on the island, has been in constant eruption for 35 years. Lava flows from the volcano have covered 48 square miles, according to the USGS. 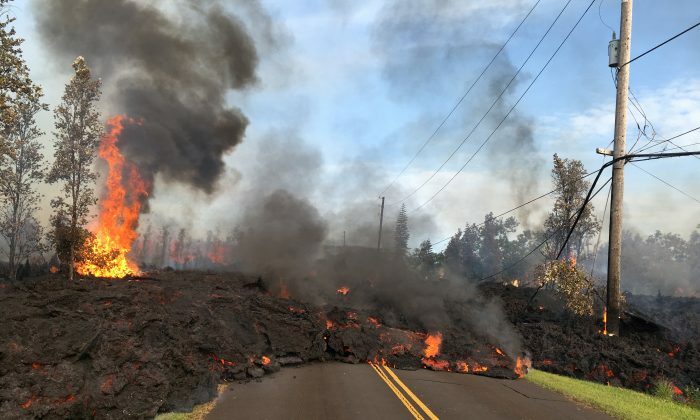 Kilauea began spewing lava into residential areas on Thursday after a series of earthquakes over the preceding week. Starting around 11 a.m. on Friday, the island experienced a flurry of earthquakes, culminating in the massive magnitude 6.9 tremor. No injuries or deaths were reported, but Hawaii Governor David Ige activated the Hawaii National Guard to provide emergency help. U.S. Representative Tulsi Gabbard of Hawaii called on federal officials to send help quickly. Gabbard said more than 1,800 residents in Leilani Estates and Lanipuna Gardens have been ordered to leave their homes since Thursday, when public works officials first reported steam and lava erupting from fissures in a road.